Hurray!!! It’s party time as the internet giant Google turns a year older and officially it’s an adult now. Yes, Google has turned 18 today and to mark this special occasion doodler, Gerben Steenks has designed today’s doodle more colourfully. The colourful animated doodle shows how Google is celebrating its birthday. 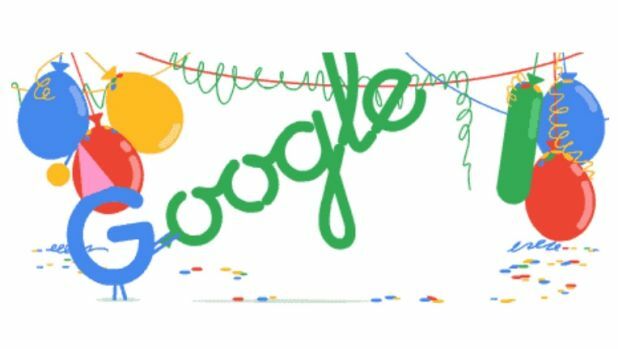 Different colours of balloons, party poppers and cute tiny triangular hat on letter ‘G’ make its perfect doodle to all web browsers. Today, 27 September with the cute animated celebratory doodle especially letter ‘G’ is blowing up the balloon and flew away definitely marks the happiness and funny moment around the world. The Google Company was established by Larry Page and Sergey Brin in 1998. It is since started celebrating its birthday on 27th September in the year 2006. But Google changed its birthday celebrations to September 26 in 2015. ‘When is Google’s Birthday’, everyone got stuck with this and are confused. Now it looks like the internet giant Google itself is not sure about its birthday date. It celebrated on four different dates they are 7th (in 2004), 8th (in 2003), 26th (2015) and 27. But the date stuck in everyone’s mind is September 27. The team of doodlers have created over 2000 doodles till now and made the world into a happiest moment even a second. Doodles are fun and surprising and sometimes the designing of Google logo involves celebrations of holidays, anniversaries, and lives of famous artists, pioneers and scientists of different countries. Google was incorporated as the privately held company on September 4 in 1998. And in the same year, Google started designing its doodles. The very first Google Doodle which was designed by Larry Page and Sergey Brin was in honour of the Burning Man Festival, and the doodle was posted on August 30, in 1998. The preparations for Google’s 18th birthday celebrations were started almost a week ago. There are so many pictures of the celebration that are already doing rounds on social media platform. And finally, the cute birthday doodle is out. The search engine Google, which kept the whole world at our fingertips here ‘We Wishing a Very ‘Happy Birthday’..!!! !